What excursions and events are included? Regardless of which trip you are traveling on, Breakaway Tours has hand picked some of the best excursions and planned the best exclusive Night Events for you and your group! Since we have so many different trips, the destination you are traveling to will determine which events and excursions are included in the cost of your trip and which are optional to purchase at an additional cost. Head over to your online profile to check out the details for your specific trip! 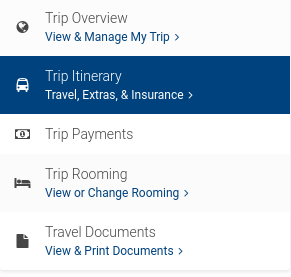 Once you have logged in, simply click "Trip Itinerary" on the left- hand side of the screen and scroll down to the "Travel Exclusives" section. There will be an orange banner over the photo which will say "Included", or it will show the price of the excursion or event if you want to add it. You can click on the drop down for a brief description of each event or to purchase them if it's not already included.